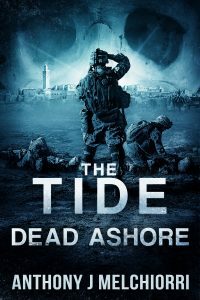 Book 6 in Anthony J Melchiorri’s The Tide series. In Morocco, tourists and merchants once packed the winding alleys and expansive markets of Tangier. Now there are only Skulls. Captain Dominic Holland and the Hunters pursue the mysterious organization responsible for the Oni Agent straight into the ravaged city. But something more frightening than anything they’ve encountered awaits. Across the Atlantic, Colonel Jacob Shepherd is tasked with delivering a key enemy scientist to the United States Government. But no journey at the end of the world is without disaster. Faced with a mission derailed by catastrophe, Shepherd must make an impossible choice to save his country—and the world.